When you hear about Caribbean destinations, Dominica (pronounced “Dom-in-EEK-a”) isn’t a name that comes up often. In fact, when I decided to take a trip there, most people assumed I was referring to the Dominican Republic whenever I brought up my travel plans. Though more and more travelers are beginning to take notice, Dominica remains somewhat of a hidden gem. Situated between Guadeloupe and Martinique, over two thirds of the island is covered in tropical rainforest. As such, this is not a destination for poolside lounging or margaritas on the beach. 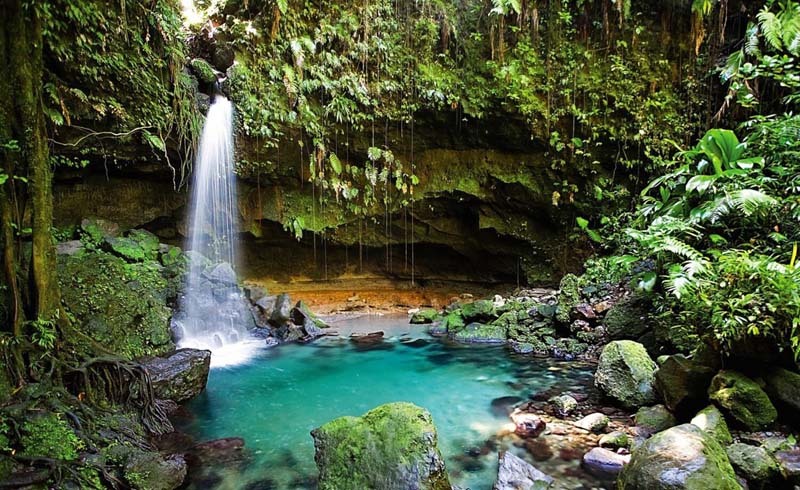 Dominica is all about immersing yourself in nature and the perfect pace for active travelers. My backpack filled with adventure travel essentials and neck pillow in tow, I hopped a flight to Antigua and then boarded a small plane to the Caribbean’s Nature Island. While there, I discovered plenty of adventure travel-friendly activities to do on the island. The first sightseeing stop during my weeklong adventure in Dominica was Trafalgar Falls, twin waterfalls known as Mother and Father, which plunge around 75-feet (23 meters) and 125 feet (38 meters) respectively. The falls can be found a 20-minute drive from the island’s capital of Roseau. From there, it's a short 10- to 15-minute walk to the visitor reception area along a well-maintained path. The viewing platform here makes for a great vantage point for snapping the perfect photo of both falls. The one activity I was most excited (and admittedly nervous) to try during my visit, was hiking to Boiling Lake in Morne Trois Pitons National Park. Dominica’s Boiling Lake is the second largest boiling lake in the world at 200 feet (61 meters) across and of an unknown depth. The lake is an otherworldly sight, draped in vapour and bubbling like a giant cauldron. I had never seen anything like it and was awed by what is actually a flooded fumarole—an opening in the earth’s crust that emits steam and gases from molten lava that lies beneath. The hike to reach the lake takes three to four hours one way from the village of Laudat, often on tricky terrain. But the views from the top and uniquely changing topography of the hike itself, including rainforest and montane forest, make any potential post-trek pain well worth it. You absolutely need a guide for this hike, which can be arranged through your hotel or even by asking around in Roseau for someone reputable to take you. Good hiking shoes and a water-resistant backpack are also a must. I’d heard before leaving that Dominica was an excellent place for whale. Although sightings are most common between November and March, the island is the only place in the world where sperm whales reside all year long, and the waters are also home to many other whale species including humpback whales and short-fin pilot whales. But it’s the massive sperm whales—the largest toothed whale species in the world—that are truly mesmerizing. Dive Dominica offers whale watching trips every Sunday and tours run for around three to three and half hours. Several sperm whales were spotting from our boat, as well as a few schools of dolphins. A leisurely walk through the foliage-filled grounds of Papillote Tropical Gardens means being enveloped in vibrant tropical plant life. Founded in 1969 by Anne Jno Baptiste, the sprawling gardens include four acres of developed trails, two waterfalls, and several natural hot springs you can take a soak in if you have time and bring a swimsuit. The gardens are open to the public from November to August and you can either explore on your own (the option I chose) or take a guided tour. The gardens are near Trafalger Falls, so the two attractions can be easily combined in one day. Creole for “Little Corner of Hot Water” Ti Kwen Glo Cho Hot Springs turned out to be a major highlight during my visit. The family-owned and operated business is located in the village of Wotten Waven, and features hot water pools and deep copper bathtubs filled with mineral rich sulphur waters from Dominica’s volcanic origins. There’s nothing quite like soaking in your own personal tub surrounded by tropical foliage. When you need a break from the heat, there are several natural cold showers on the property to cool off. 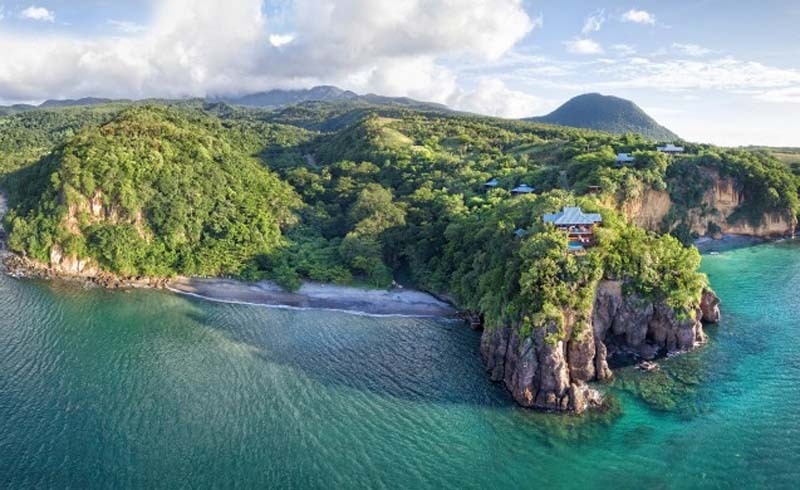 Headed to Dominica or another Caribbean Island for an active escape? This packing list will help you bring decide what to bring!